The Culligan IC-100A Icemaker/Water Dispenser Filter reduces the bad tastes, odors, and aesthetic chlorine taste and odor often associated with tap water. A bed of granular activated carbon adsorbs them as they flow through the filter. The Culligan IC-100A refrigerator water filters produce cleaner, healthier, better-tasting ice cubes and beverages. It works great as an inline filter for water dispensers and ice makers. 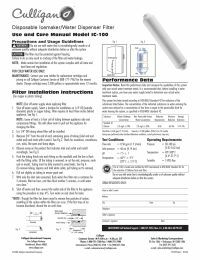 NOTE: The Culligan IC-100A features quick fittings that remove the need for adaptors, compared to the discontinued Culligan IC-100, which featured 1/4 female threads.